Ever wonder what astronauts eat when they’re hovering thousands of miles above the Earth? In space, there are no fast food burger joints, deli shops, or even a side street hotdog stand. Although enjoying a gourmet meal in outer space with the Earth as a backdrop sounds exciting, it isn’t possible. Before you think of space food as being eaten out of toothpaste tubes or little bouillon cubes, think again. We’re in the 21st century now. Astronauts have a very discriminating palette. The space shuttles do not have refrigerators so food must be safe to store at room temperature for a year and should last around a year and a half. To adjust to these conditions, food is dehydrated, vacuum packed and freeze dried. Just add water, wait a few minutes, and it’s good to go. Aside from allaying hunger, space food’s main priority is to provide the correct and proper nutrition a growing astronaut needs. One major supplement is Spirulina. 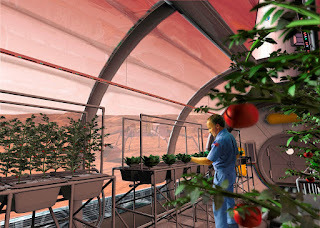 NASA and ESA have both proposed cultivating it as one of the primary foods for deep space travel and long-term space missions. Spirulina are free-floating filamentous cyanobacteria characterized by cylindrical, multi-cellular trichomes in an open left-hand helix. In layman’s terms, Spirulina is an algae. A blue green moss found near lakes and under rocks. Spirulina contains 3 to 4 times rich vegetable protein than fish or beef. It also has a high volume of beta-carotene for cell protection, gamma-Linolein acid to prevent cholesterol and prevent heart disease, and a good dose of multi vitamins and minerals. Since all the vitamins, minerals and what not are naturally inherent to it, we have a nutritional source that is easily absorbed by the body. Since the surge of organic food supplements, Spirulina has been in the forefront as one of the best natural source of nutrients. So when the rocket scientists of NASA had to don the chef’s hat, they quickly found the benefits of using spirulina as a base for space food. They are even thinking of having Spirulina grown in space. Spirulina is available in the market in tablet form, flake form and even powder form. Most over the counter, garden variety multivitamin supplements can match the ingredients found in Spirulina. But few can boast it to be naturally inherent to it and can be assimilated by the body faster. Vitamins and Enzymes of Spirulina; Vitamin A (beta carotene), Vitamin B1 (Thiamin), Vitamin B2 (Riboflavin, Vitamin B3 (Niacin), Vitamin B6, Vitamin B12, Inositol, Folic Acid, Pantothenic Acid, and an anti oxidant enzyme activity called Superoxide Dismutase. Carotenoids and Phytonutrients found in Spirulina are: Beta-carotene 9cis, Beta-carotene 13cis, Beta-carotene 15cis, Beta-carotene all-trans, Zeaxanthine, total carotenoids including carotenes, Phycocyanin-crude, and C-Phycocyanin. Spirulina’s minerals are: Calcium, Magnesium, Iron, Phosphorus, Potassium, Sodium, Manganese, Zinc, Boron, Copper, and Molybdenum. Fatty Acids present in it are: Gamma Linolenic (GLA), Essential Linolenic, Dibomegamma Linolenic, Palmitoleic, Oleic, Myristoleic, Palmitic Acid, Myristic Acid, Straric Acid, Arachidonic Acid, and Bohemic Acid. Now that’s a lot from something you get from under a rock. So, whenever you have the urge to jump on the natural and organic bandwagon, don’t forget this little powerhouse. If it’s ok for space walkers, it darn should be good for landlubbers too.